Mario Gotze has placed a host of European giants on red alert by admitting that he is open to a move away from Bayern Munich at some stage in his career – according to reports by Goal.com. The 22-year-old, who joined Munich from Borussia Dortmund in 2013, has suggested he may look to move abroad in the future, despite stating that he is happy with the Bavarian giants. Gotze, who scored the winning goal in the World Cup final earlier this year, was previously linked with Manchester United, Arsenal, and Chelsea before leaving Dortmund the summer before last. The attacking midfielder explained that he would be sorely tempted by a move abroad: “I am very, very happy to be playing at Bayern, in Germany,” he told Bild. 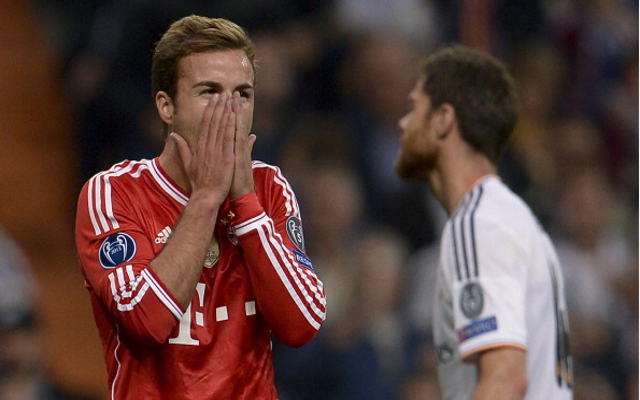 Since leaving Dortmund, Gotze had made 49 appearances for Munich, scoring 17 times. He also struck twice during the tournament in Brazil this summer, once against Argentina, and once against Ghana.